Getting wood to turn on you lathe can be a challenge. 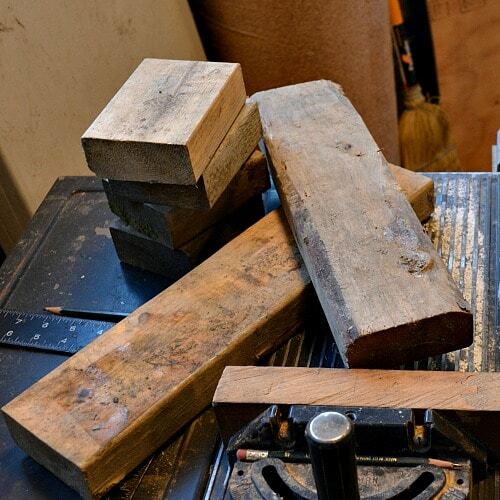 However the off cuts from a building site have great potential as practice turning blanks. Off cuts of commercial 2 x4s make good turning blanks for beginners. The wood is usually fir, spruce, or pine. These are soft woods rather than hard woods. The goal is to practice and improve your turning technique. More about that later, right now we need to get some turning blanks. Did you just get your lathe? It is exciting to own a lathe but now you need to set it up and turn some wood. 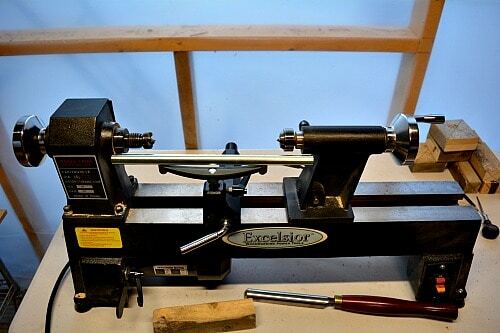 How to maintain your wood lathe will tell you all about the different parts of your lathe. What we want to do now is get some wood spinning on that lathe. You can pick up off cuts of dimensioned wood from your own projects, maybe a neighbor, or from the house being built just down the street. (Make sure you ask first.) Reject any wood that is green or has repeated indents in the wood. These are treated wood and the preservatives would be toxic to you when you turn. Make sure there are no nails or staples in the wood either. 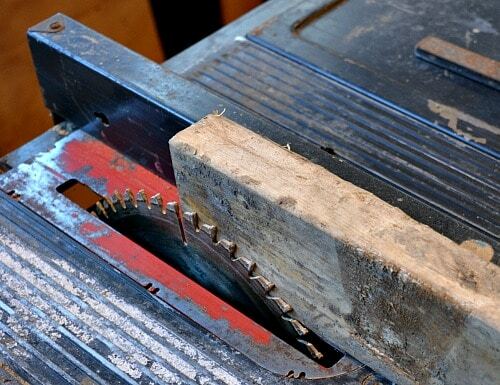 That is not good for your table saws or your turning tools. For me a standard 2 x 4 is actually 1.5” x 3.5”. What this means is that a 6” long piece of 2×4 will give you two turning blanks. Utilizing pieces that are under a foot in length is taking wood that would be thrown away and using it for a good purpose. If you have short pieces, at least 3.5” in length, then you can make squares to practice your bowl turning techniques with as well. A quick trip around my shop turned up a couple of long 2x4s and a collection of small ones for squares. To set the table saw up for spindle turning blanks attach your rip fence. 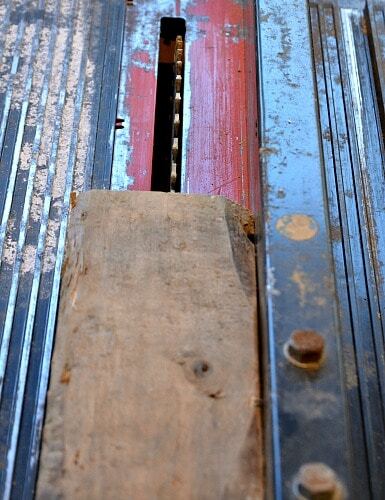 The first step is to stand a 2×4 on edge (the 1.5” side) and place that between your blade and your rip fence. 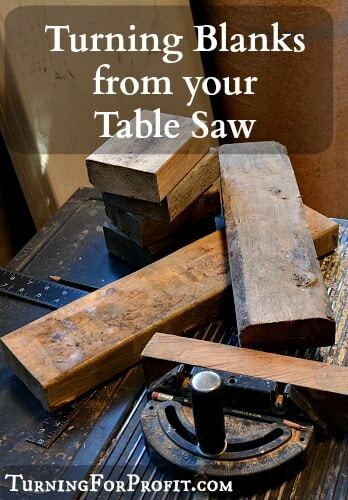 Use the narrow side of the piece of wood to determine the width of the cut. 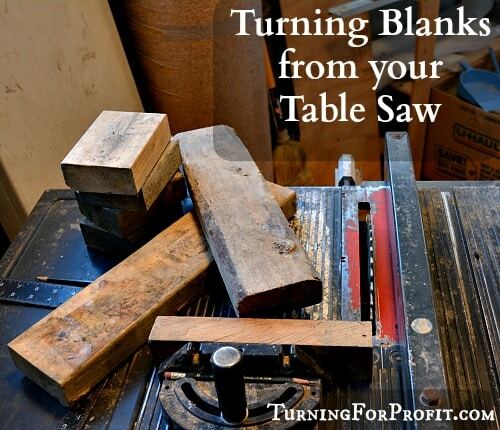 Then all of your ripping of the wood will produce a square (1.5” x 1.5”) turning blank. Take the wood away. Turn your saw on. 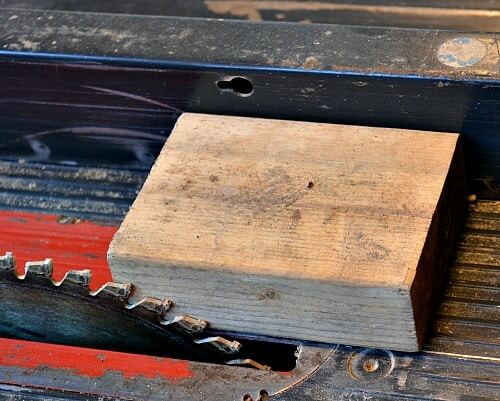 Place the flat side of the 2×4 on the saw and rip off a blank. Use push sticks to keep your fingers well away from the saw blade. Move the cut blank out of the way. Now put the thicker part of the 2×4 on the table saw and rip a second turning blank. So one 2×4 gives you two blanks. 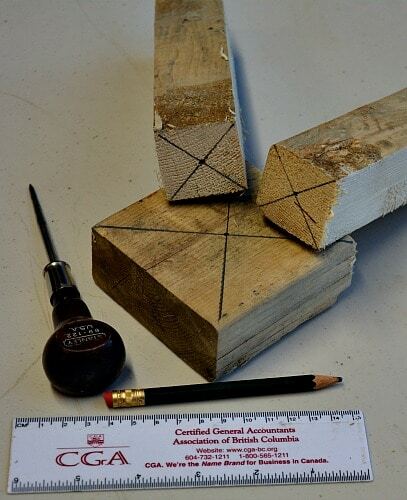 Each length of 2×4 will give you two turning blanks and a thin strip as well. These blanks are quite long so I’m going to cut them down to 7” in length. This is for practice so I would cut them no longer than my tool rest. That way, when you turn, you do not have to move your tool rest all the time. Move the rip fence away from the table saw blade. 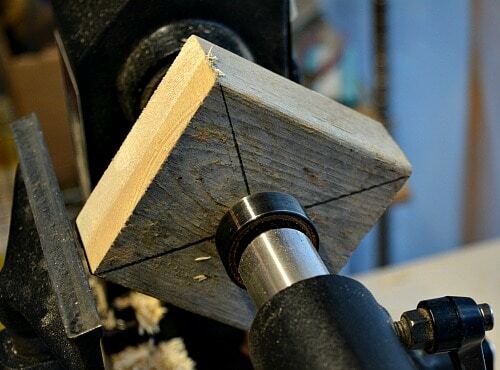 Use your miter gauge to hold the wood and cut the blank to the length you want. You can also cut branches this way as well. Just make sure you are holding the branch securely to your miter gauge. Ensure that the part of the board or branch on the far side of the saw blade is not binding on anything and will simply drop to the top of the table saw once it is cut. In this case we want to cut a square out of the 2×4 that is 3.5” x 3.5”. 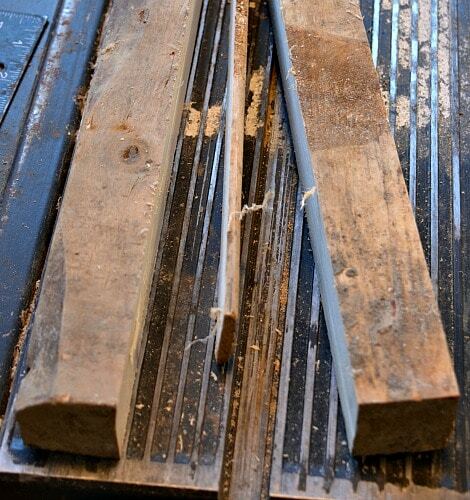 Use the same procedure as the first step and align your rip fence with the saw using the 2×4 as a measure (3.5”). Turn the block at right angles and hold the block against the rip fence as you cut it. Fingers are kept well away from the saw blade. Push blocks are a really good idea. Cut the block square. The small end of the 2×4 will stop once the board has been cut through. 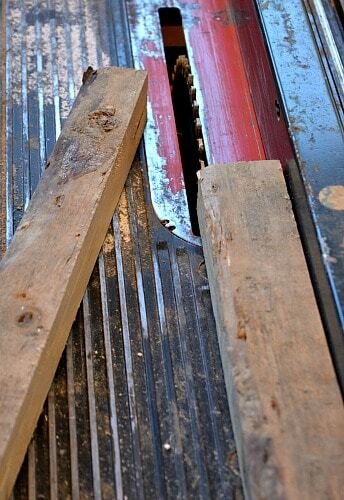 Use a push stick to move the wood from the rotating saw. Don’t allow your off cuts to accumulate as you are cutting. Keep your table saw clear and clean. I am calling these squares bowl blanks because you will be using bowl turning techniques to turn them. I turned a Mason jar lid out of mine. For your spindle blanks draw lines from opposite corners. A sharp pencil and a short ruler will make it easier. The intersection is the middle. 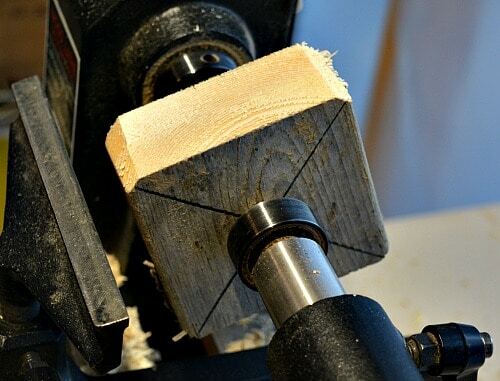 Use a wood awl to make a hole at the intersection. For the bowl blanks again draw lines on the face of the blank from opposite corners. Use the awl to mark a hole at the intersection. It may seem silly but you will get better at finding the center the more often you do it. Right now close is good enough as you are practicing with this wood anyway. Pick up your spindle blank and alight the awl hole with the point on the drive spur. Then bring the tail stock up and align the point on the live center with the awl hole on the other end. Tighten your tail stock so that it won’t move on the lathe. When it is centered, advance the quill fixing the blank between the two points. This is between center, or spindle, turning. The grain in the turning blank is parallel to the axis that the lathe spins on. Then bring your tool rest up to the blank. Position the height of the tool rest at the center of the blank. Then rotate the blank by hand to ensure that you do not bind on the tool rest. Stand to the side when you turn your lathe on. This time the wood is probably secure but sometimes (when I go too fast) things can be loose and the blank can come off of the lathe. Since you don’t know when you are going to leave it loose make it a habit to always stand to the side (out of the line of fire) whenever you turn on your lathe. 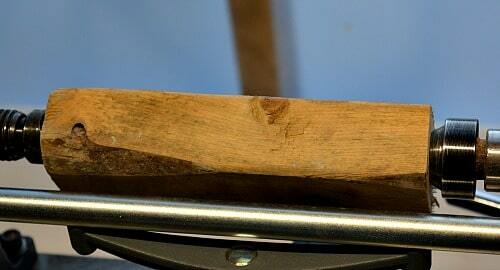 Use your spindle roughing gouge to start shaping the wood. At this point you just want a fairly even cylinder with all the flat area on the sides removed. As you can see here the amount removed from the corners of the turning blank is about equal which shows that we centered the blank well. Like I said before this is practice time and if you have three corners being cut but not the fourth then keep cutting and eventually the piece will be round. How to use your roughing gouge will show you more on this tool. Pick a block from your square turning blanks and use the same procedure as with the spindle blank. This time you will be bringing the tail stock much closer to your head stock. The 2×4 is only 1 1/2″ thick. Use the awl holes to align the blank in the head stock and tail stock. Extend the quill to tighten the blank in place. You will have to place your tool rest farther away as the corners on your square block extend the farthest away from your lathe’s center. Put away the spindle roughing gouge. The fibers of the wood are at right angles compared to spindle turning and the profile of your roughing gouge is not the best. 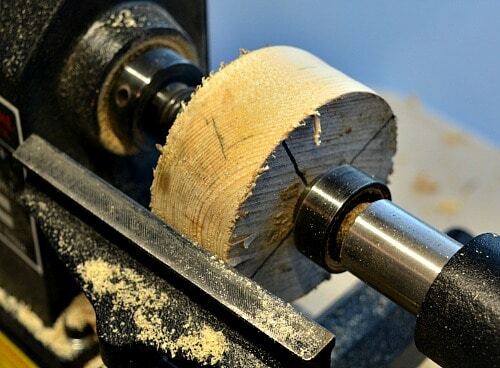 Use your bowl gouge to turn the blank round. With your bowl gouge take small bites off of the blank. You are turning a lot of air at this point. When you have a little bit gone stop the lathe and see how you’ve done. If each corner is nibbled the same amount then you were very accurate in marking the centers. If not then you will need to turn a little bit longer to get the blank round. Move your tool rest in as you turn the blank round. To see where to move the tool rest rotate the square blank until a cut portion is by the tool rest. You have cut this wood so you can safely move the tool rest up to that point. 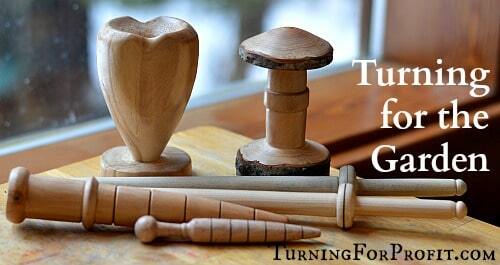 Now you have a collection of turning blanks that are round and ready for the next step. You can certainly turn any project you want but you can also try taking different cuts at different angles. If you get a catch then you have learned what won’t work! Keep experimenting and seeing what your tools can do. For example, if you want to practice with your spindle gouge then put a spindle blank on your lathe and practice making beads and coves. These two shapes, combined with smooth sections in between, are the basis for all types of spindle turning. At one workshop the instructor wanted us to do one side of a bead all of the way along the turning blank. He wanted us to build up a body memory of how to turn the right side of a bead. Then we could work on the left side. This is perfect wood for doing that type of practice.